Flea infestations inside the home can make you and your family’s lives miserable. Turning a blind eye to this problem will only make it worse, as a single female flea can lay over 5,000 eggs in their lifetime. These disturbingly resilient blood-sucking parasites may elude all of the traditional methods of treatment, forcing you to look elsewhere for solutions. If you’re struggling to regain control of your home, you should consider using borax to eliminate these parasites. Whether they’re dog fleas, cat fleas, human fleas or any other common species, borax is an effective, pet-friendly treatment for all fleas. Sprinkling this stuff throughout your home – particularly in areas of high flea activity – will offer near-instant results, killing fleas on contact. Borax (sodium borate) is a naturally occurring compound with characteristics similar to sodium (although I wouldn’t recommend sprinkling it on your food). Borax is commonly found in a variety of household cleaning products, laundry detergents, ceramics and even glass. It’s important to note that borax and boric acid are two very different elements. If you’re going to treat a flea infestation in your home using this method, stick with the actual borax and not boric acid. 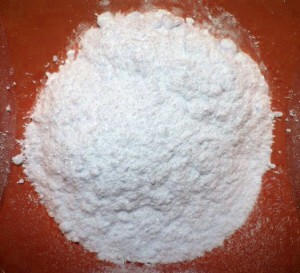 Boric acid contains additives, such as hydrochloric acid, which drastically lowers its pH level to the point where it may harm children and small pets. This isn’t a problem with borax, however, as it’s 100% non-toxic with a neutral pH level. Avoid the use of boric acid, as it’s toxic to small children and pets. Purchase the 100% pure, powdered variety of borax. Sprinkle a generous amount throughout your home, covering the floors, baseboards and entryways. Use a broom to spread the borax powder evenly across your floors. Allow the borax to sit for at least 24 hours and vacuum it up the following day. If your flea problem persists, apply a second round of borax 2 days after the original application. Continue this cycle until you’ve eliminated them from your house. Unlike many other treatment products, borax does not kill fleas by chemically burning them. Instead, it dehydrates them on contact, exhausting their moisture content until their bodies shut down and are no longer able to operate. When a flea travels over a patch of borax (it doesn’t take much, FYI), it become instantly dehydrated, crippling its organs while limiting its mobility. Because it kills fleas through dehydration, borax is considered a safe treatment method for home and families with small pets. Fido can run right over a patch of borax without suffering from any ill effects.